Forgot to take a picture at Devil's Kettle and my phone as dead for Jackie O's. 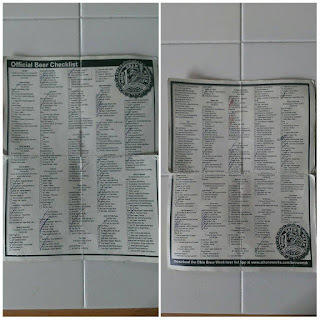 Yesterday was the last official day of Ohio Brew Week 2015. I spent four glorious days in Athens for it before driving back to Cincinnati in order to be at work on Friday. Life continues while you're away, right? 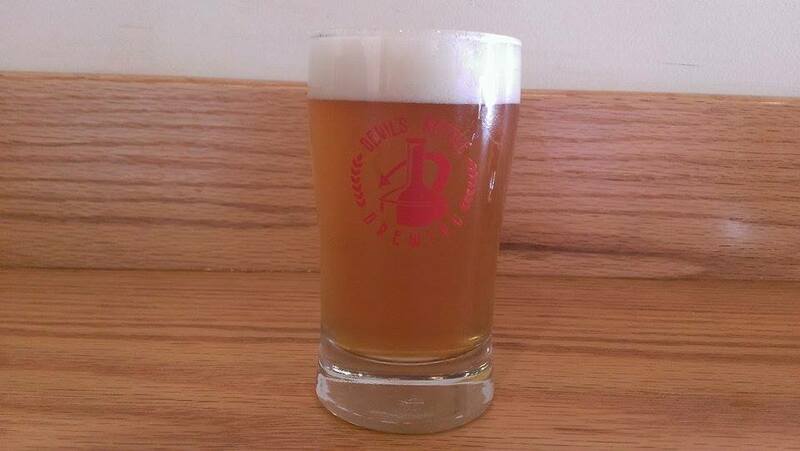 Anyway, day four started at Devil's Kettle for their Wednesday Hops School offering. 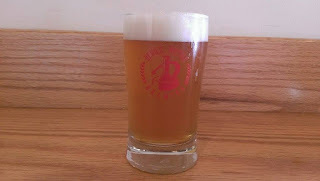 This time they had dry-hopped Spider Silk with summit hops, which gave the blonde ale a strong berry flavor. I visited DK three days in a row and I'm anxiously awaiting the chance to get back there. Since I had my car out (Devil's Kettle isn't quite walking distance from where I was staying) my friends and I thought it would be a good idea to check out Little Fish (which also wasn't within walking distance). After being lost for a few minutes due to a wrong turn we made it to the brewery. 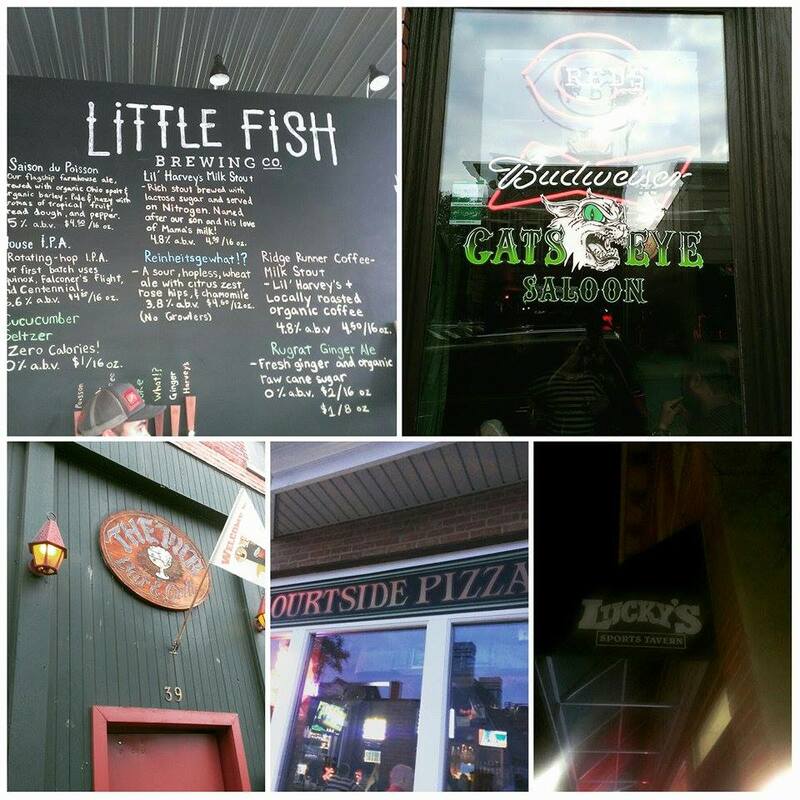 Little Fish is Athens newest brewery and the venue has a totally different feel than Devil's Kettle and Jackie O's. All three breweries have very much crafted their own space within the community. 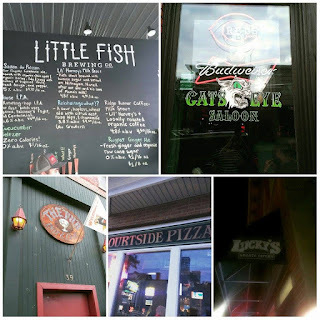 As far as their beers go, Little Fish definitely holds their ground with Athens' other breweries. 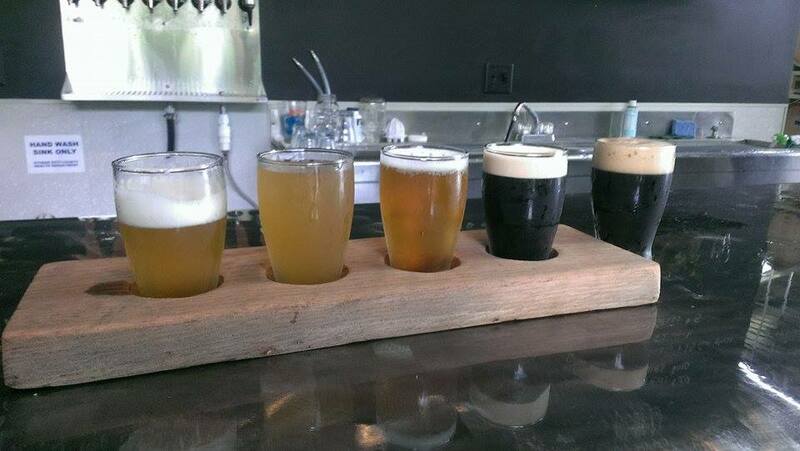 I had all five of their draft offerings: Saison Du Poisson (a brew with a fruity punch), Reinheitsgewhat!? (a tangy, sour beer), the House IPA (tart and brewed with four kinds of hops), Ridge-Runner Coffee Milk Stout (a stout that tastes just like coffee), and Lil' Harvey's Milk Stout (milky, cream, and rich). These were all great brews, but Lil' Harvey's stood out to me the most and, as such, is my favorite of the five. After Little Fish we drove into town and went Cat's Eye Saloon. They had Fat Head's and Thristy Dog on tap, which was fine by me; both brewers have great beer. 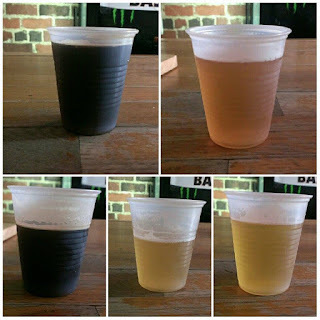 From Fat Head's I had Sunshine Daydream Session IPA (tasted like berries and oranges), Midnight Moonlight (a creamy dark IPA), and Jack Straw Pilsner (crisp with a slightly bitter finish). 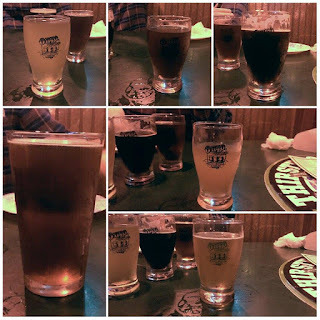 The Great Lakes brews I tried were Alberta Clipper Porter (coffee, chocolate, and raspberry? Sign me up!) 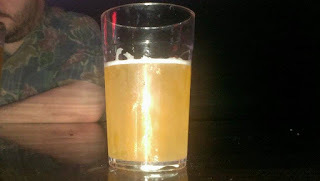 and Sharpshooter Session Wheat IPA (lots of creaminess from the wheat). 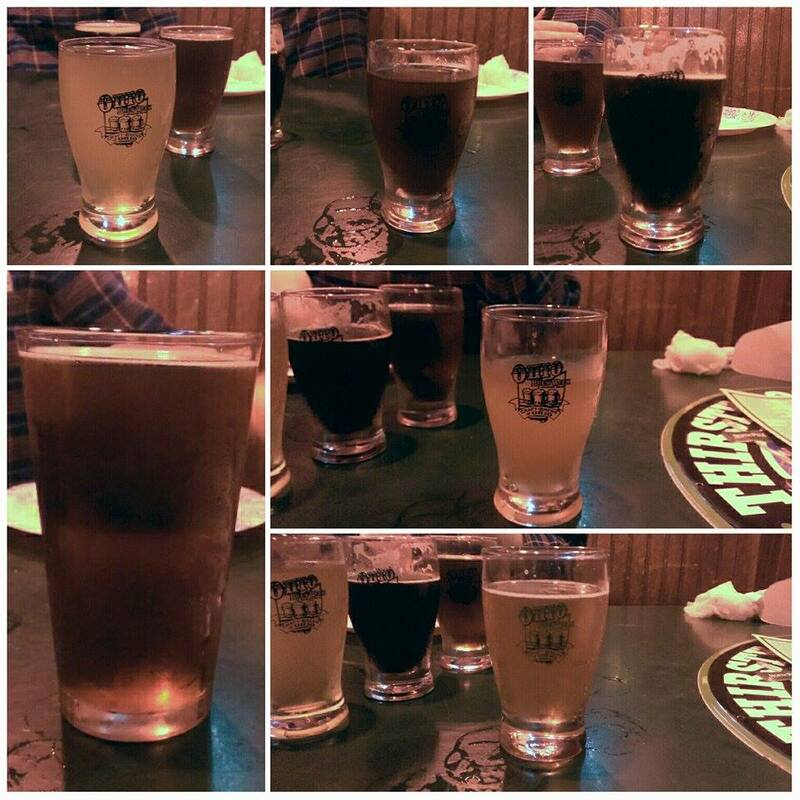 All of these were great beers. Upon leaving Cat's Eye we decided to stop by The Pub for some grub. To our dismay the kitchen was closed but we didn't mind too much because Thirsty Dog had taken over the bar for Christmas in July! Apart from serving free finger-food the brewery also had 12 Dogs of Christmas on tap (of which I had a pint). There were three other breweries represented here and I tried some of their brews. I had Hoppin' Frog's Turbo Shandy (this was almost too sweet for me), Weasel Boy's Plaid Ferret Scottish Ale (with a very strong punch of alcohol) and Mango Wheat (the mango didn't hit me until the aftertaste), and Rocky River's Oompaloompa Chocolate Stout (the chocolate was nicely balanced with the stout flavor) and Blueberry Ale (as close to a perfect blueberry ale as I can fathom). I liked everything I had at The Pub, but 12 Dogs stood out because I love me some Christmas Ale. No offense to Thristy Dog's snacks but we were still hungry after leaving The Pub so we went to Courtside Pizza to try one of brews they had and (you'll never guess this) get some pizza (75¢ slice night, baby). The only beer I had here was Maumee Bay's Blackberry Belgian Wit (surprise, surprise: it tasted like blackberries. My girlfriend would love it). It was a Wednesday night in Athens so, according to tradition there was a certain stop I had to make: Lucky's Sports Tavern for liquor pitchers (a pitcher of a mixed [well-liquor] drink for $5). I also had a single beer at this stop: Catawba Island's Hot Blonde (which is brewed with habanero and mango; spicy and sweet). I apologize for the blurry picture. It was literally the best my phone could do. 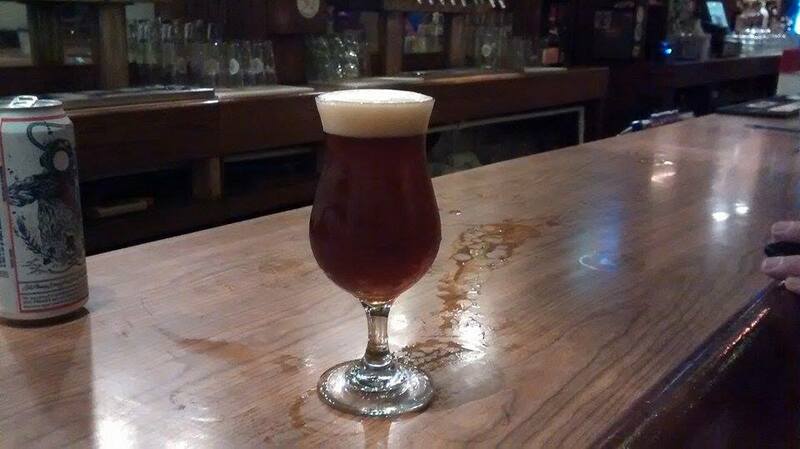 Finally, I finished my Brew Week experience at the same place I started it (I'm a sucker for circular endings): Jackie O's. My phone was dead by this point so the supplied picture comes from a friend. Much like Lucky's and Courtside before it, I tried just one beer here: Actual's Conductor (an Imperial Rye IPA that wasn't too hoppy but had a definite bite). I actually went there for Actual's Fat Julian, which had been recommended to me Mike Ortiz, Actual's head sales guy, whom I had met earlier that day. 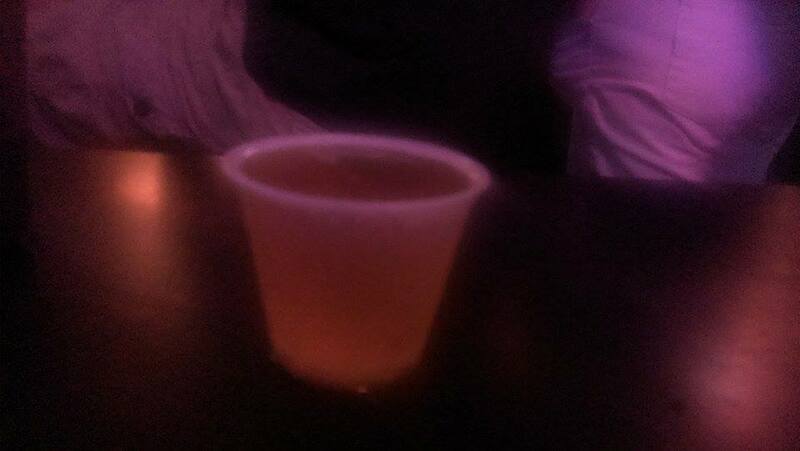 Jackie O's was out of Fat Julian, but Mike was there so I hung out with him for a hot minute--he's a good dude. He quickly suggested that I try Conductor and I was off (and done) from there. Its 8.1% ABV was a perfect way for me to end my time in Athens. So, what was my official score? 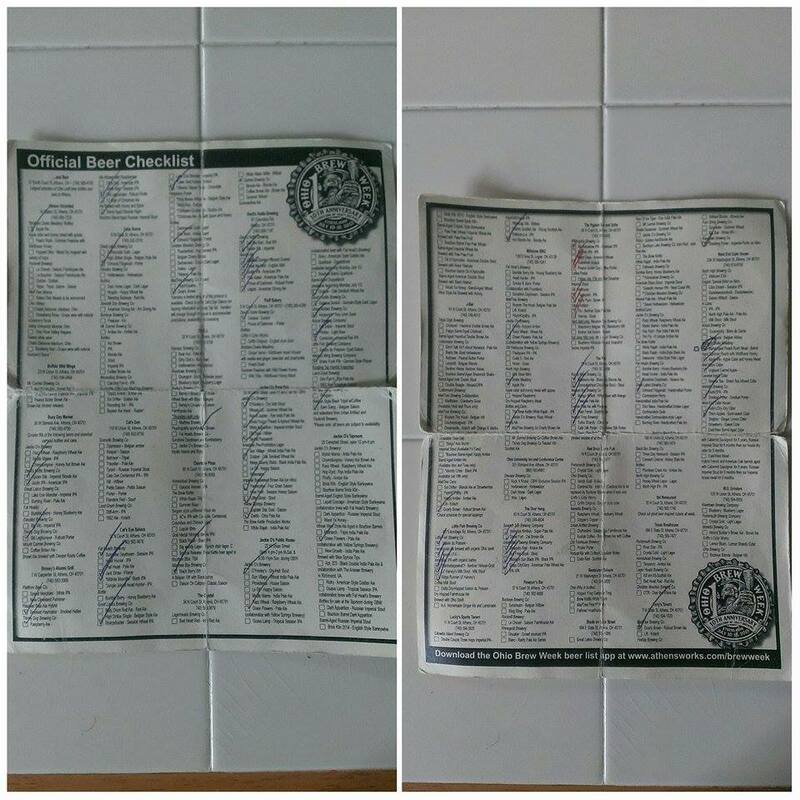 According to my Untappd I had 67 different brews. Don't believe me? Good. I didn't double check my count or anything. But I'm posting my Brew Week list under this paragraph. So either look at that (there are duplicates on there, and it doesn't account for Hops School) or click the link for my Untappd account to see for yourself! What was my favorite brew of the week? Well, that'd be Jackie O's White Apparition followed closely by Thirsty Dog's 12 Dogs of Christmas. 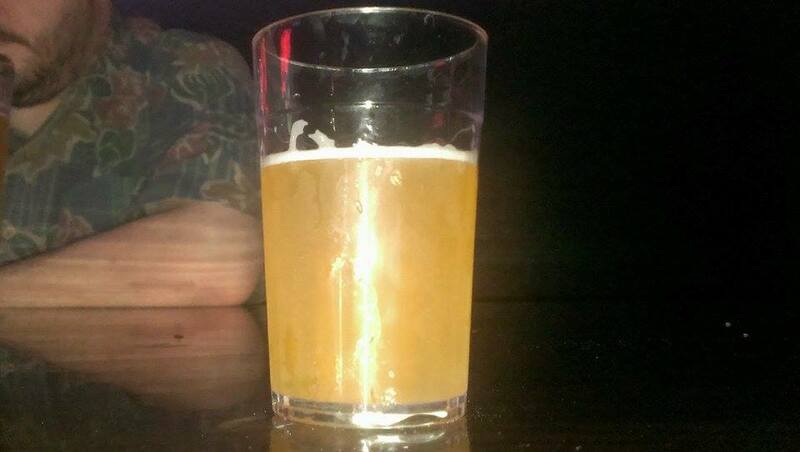 But, I knew I would love those going into it so I'll tell you my favorite Brew Week beer that I hadn't had before: Great Lake's Sharpshooter. No hard feeling intended for any of the any of the breweries represented; you all had great, great beer (some more than others) but Sharpshooter won me over. It's wheaty creaminess was unexpected and it has me wishing I had a bottle of the stuff right now. There's a really good chance that this was the last Ohio Brew Week where I could spend a good amount of time in Athens. The time was right for me this year: I could get off work, I had a place to stay, and I had a lot of friends with whom I could get out and drink. Next summer (and most likely all future summers) I won't get to go all out like this. Of course I'll try to make it back for a night or two when I can, but this year was a once-in-a-lifetime perfect storm. Thanks for sticking with me through the week and reading about my crazy exploits. I hope you got some enjoyment out of them.